Meghan and Kate should get a good hair trim. It is going to be dueling duchesses on appearances both constantly pushing their hair back away from their faces. If only some new hairstyle not involving long hair parted in the middle comes around. ^ Kate has gotten a good hair trim. Now it's time for Meggles to do something. How will this marriage stop the Commonwealth countries from leaving? I would think it would make them leave because of the unsuitability of this marriage. I had more of a crowd in Scotland watching my clan march down royal mile, actually all the clans that gathered that day marched down Royal mile. But it was summer in all fairness. Her outfit was casual and Harry needs to find a new color to add to his wardrobe. They looked okay together. She is not very stylish as it turns out. And very ordinary looking even with the nose job. Somehow she looked better on Suits. Harry is not a future King. The Queen deemed the marriage suitable. I don't see a problem. The next in line for King is Charles with Harry further down in line of succession. If it were unsuitable, Harry would have stepped out of line of succession. He didn't. I don’t think anyone’s been at the helm of the BRF for some time. From the PD fiasco to the Middleton Invasion to Camilla to this mess. A lot of really bad ideas continue is all this stupid setup with PH is. I like that she's wearing trousers and (mostly, not always) is weather appropriately dressed, but those trousers are seriously fugly. On top they look good (love the pearl buttons), but the palazzo/ bell bottom lower part is just horrid, and very Vic Beckham-like. Shows that fitted trousers look much much better, also these don't pick up dirt and rain off the street and don't pose a tripping hazard, and don't need stilettos to even be able to wear them at all... So much nicer (the below example)! "Well done boy! Well done! Also don't forget your sugar plum Murkles is right here, dahling!" "I'm so glad you came, but really look at my ring with Diana's diamonds!" If the pony had done a nice shyte, then her trousers could have wiped up that mess in no time! Alas, horsey was well behaved and went to the loo beforehand.. Overall she looked good, except the bottom part of the trousers and the obvious tartan, competing with horsey.. I'm willing to sacrifice the cold in order to not wear pants like that! ^ Wearing trousers isn't the problem, this style (palazzo/ bell bottom) is the problem. Same with Kate, skirts aren't necessarily the problem, but the length or weight of them is and she flashes all the time. Both seem to want to stick to what they like or be "stylish" or whatever tf they are thinking, and come out in totally impractical or inappropriate clothing. I can't say enough how much I love that M wears trousers and doesn't just stick to dresses and skirts like it's the 1910s or so (when it was scandalous for a woman to wear trousers). Also, I just remembered Kate's spray on jegging addiction, and compared to that these palazzos are much better. 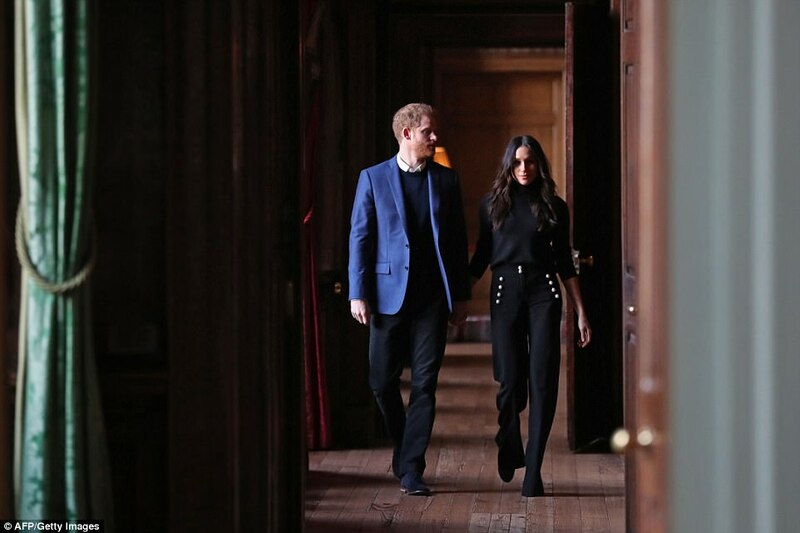 Video of Harry and Meghan a bit later on at Holyrood House meeting youth and Scottish Premier Nicola Sturgeon. Harry's personal standard flew on the flagstaff while they were there. 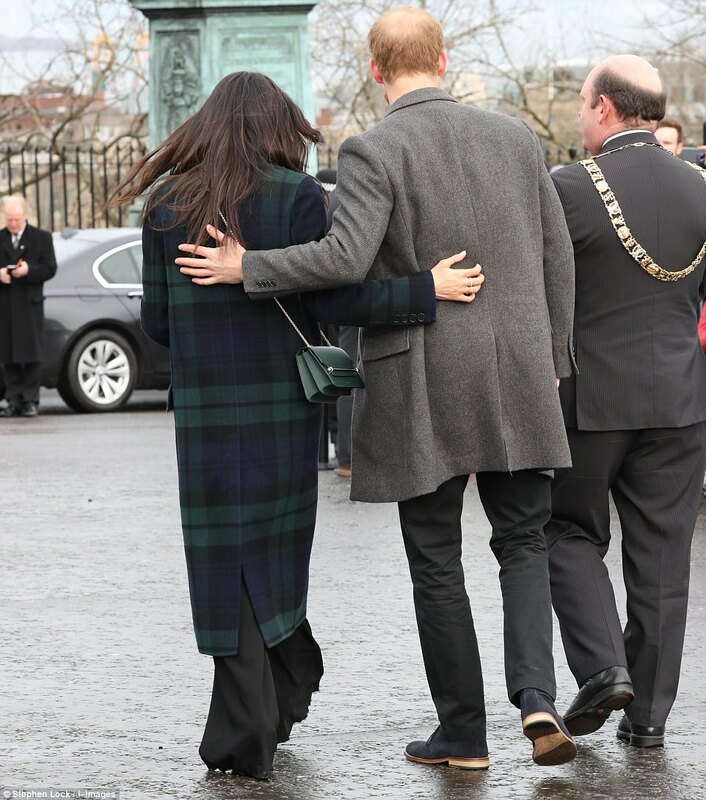 Meghan has got over shaking hands before Harry and isn't clinging on any more. I'm glad to see a little of the interior of Holyrood House here. It's a stunning place in reality and very connected with the Scottish Kings and Mary Queen of Scots. Don't know how warm it is in Feb though. I went in the summer. What I am is what I am are what you are or what? That was really nice watching the couple interact as a team. They may just get their act together. They both have strengths they can build on. 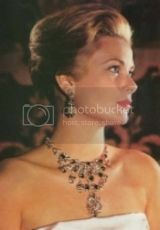 Chick will always be a yank and should be proud to be one becasue she'll nver be British or a royal. It seems like Harry was me distant with her and just concentrated on the people and task infront of him. Actually, he did that at the Endevour awards, but no matter how he treats her, she's not going anywhere as he's her meal ticket. Omid Scopie seems to be her pr as he's the one that tweeted the wedding details and what she merchandised today and prior to that, the Endevour awards. It's hard to keep up with the users, but I think this is the one who wrote for the gossip magazine and is an ex of Markus. She was inspired by MM's UN speech. Is there's an article from a behaviorist out there to explain the "good job" taps on PH's shoulder and the mommying behavior? 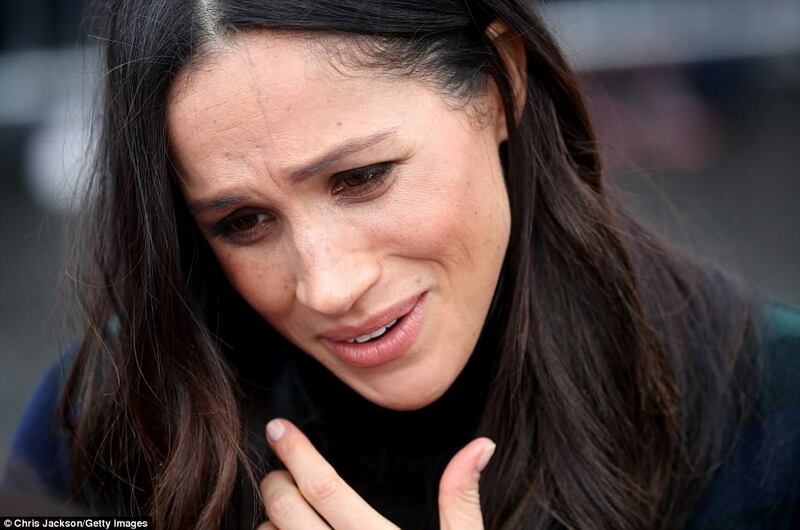 What is scary is that in the engagement interview she was smothering, after that there was the sweet innocent child that needs protection, now the smothering part comes out again. That is just the nature of their relationship IMO. She is mothering to him as that is what he needs. Whereas with Waity, her family does the mothering collectively. Sparkles is the boss of them and that is how they are. It would be interesting to see if she was that way with her ex or just is doing this to manipulative and nail Harry. Losing Di has left a void and women who know how to fill the void get them. Windsor men tend to be needy. Some more needy than others. But if she did not touch him she'd be accused of being "cold" to him. Kate doesn't touch William nor he her very much. I don't see the others touchy feely either in public. And that just is the way they are. I don't think anyone is accused of being cold although as a group they are more aloof acting than other families. If she didn't touch him, no one would say she is cold. She is too gushy to be considered cold. She overdoes it for average people I think. She is just mothering him as that is her role she has made in their relationship. It very well may change in time. It's cold here Rosella...bright afternoon but cold today...same as yesterday. I hope she got to see some of the Palace too...it's a great place...full of history as you say. As far as I can tell the feeling here was mixed about the visit..it's a bit mixed about the royals as a whole as far as I can tell. Social media was giving differing accounts of the numbers that turned up to see Harry and Megs. Interesting that they are mixed about them. I haven't been there is several years but I do remember some angry feelings for the royals and others were okay with them but more indifferent I think. This couple will be less popular it seems. From the Scottish Sun newspaper. 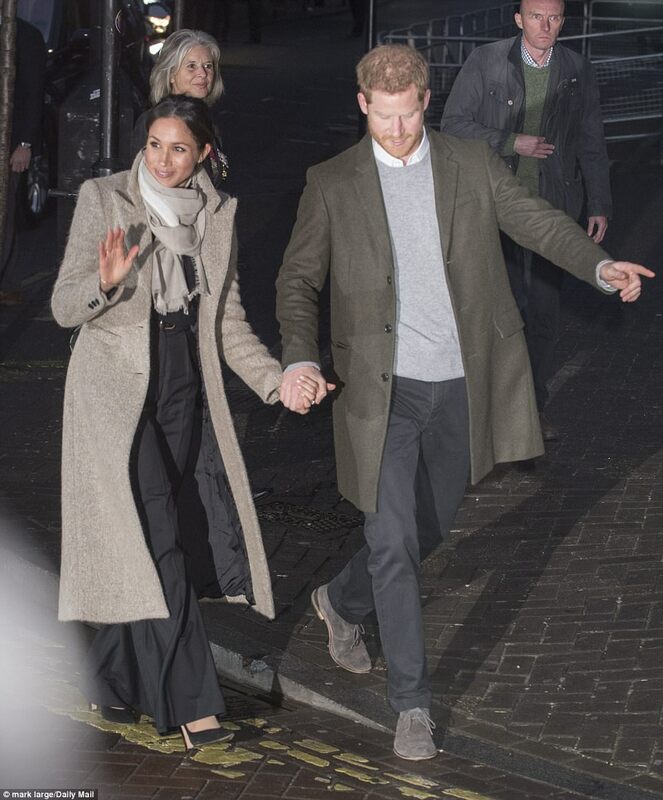 Harry tells Edinburgh crowds that he was excited from the first day he met Meghan. He's looking forward to marriage, he states. Nice article but the pics still look like she clutches him every five minutes not the other way around. That is her m.o. with with him. He is excited now. Wait a few years.